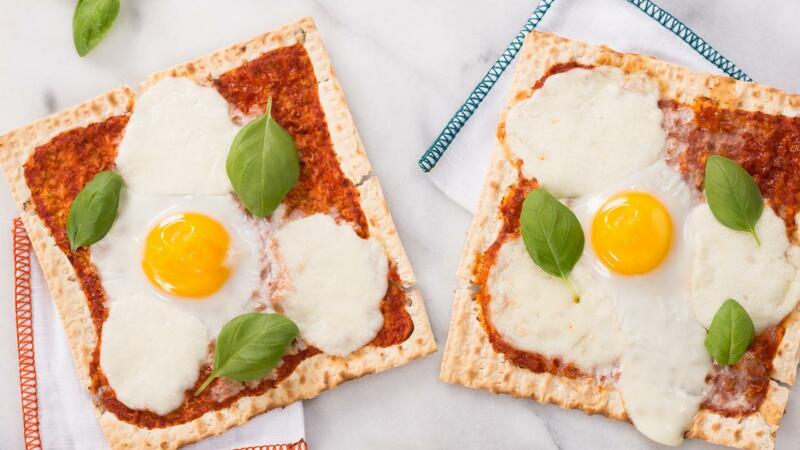 Adults and kids will love creating new traditions with these Matzo pizzas that are perfect for Passover and the rest of the year too. Preheat oven to 425°F (220°C). Arrange matzo on large parchment paper-lined baking sheet. Spread some of the pizza sauce over each matzo cracker, leaving a small border around the edge. Top each with a couple slices of buffalo mozzarella. Crack an egg in the centre of each cracker. Bake for 10 minutes or until egg white is set and yolk is cooked to desired doneness. Scatter fresh basil leaves over each pizza before serving. Personalize each pizza by adding additional toppings, such as mushrooms, onions and olives.